Several Ohio schools have canceled classes after a clown-related attack. 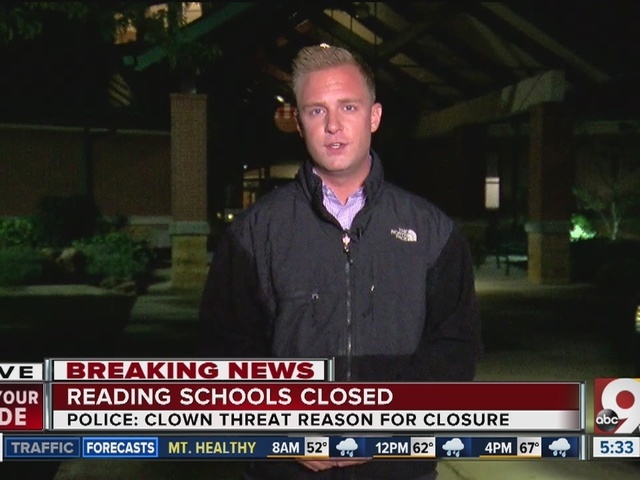 Just hours after Colerain Township (Ohio) police arrested a junior high school student Thursday evening for an online clown-related threat, schools in Reading have canceled Friday's classes for similar threats. Around 4 a.m. Friday, a woman smoking on her porch claimed a man dressed in a striped outfit, a red wig and a white clown mask grabbed her around the throat. The victim told police that the clown immediately said, "I should just kill you now and 'that some students and teachers would wish they were never born at the junior and senior high school today.' "
The woman, who recently had neck surgery, was transported to a local hospital for further evaluation. Detectives contacted Superintendent Chuck LaFata, who chose to cancel Friday's classes. "We take all threats to the safety of our students seriously. We were especially concerned with the number of students who walk to school in the early morning hours and made the decision to close school," Reading Community Schools wrote in a note posted on its Facebook page at 5:30 a.m. Friday. Another Ohio school, Mount Notre Dame High School, also canceled classes Friday, although its freshmen will go on the retreat scheduled for Friday. 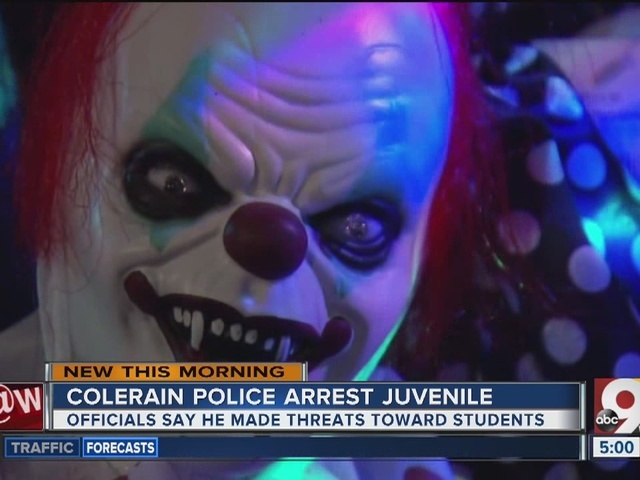 Around 10:30 p.m. Thursday, Colerain Township Police arrested a junior high student for similar clown threats. That student could be in court Friday facing charges of terroristic threatening and inducing panic. In Sharonville, an officer responded to Sharonville Elementary Thursday for a report of a "clown" wearing gloves and large shoes in a wooded area at the school, police said. The description did not include other typical clown-wear like makeup, a wig or anything else. Police found no evidence to indicate anyone was doing anything menacing in or near the school, they said. The Boone County Sheriff's Office said that deputies responded to several calls of suspicious people dressed as clowns only to find them unfounded. They asked that anyone who does call to report a clown include as much detail as possible without compromising safety. "Creepy clowns" sightings and threats have been spreading across the country lately. Locally, a threat caused about half of Gallatin County students to stay home from school one day this week, though deputies say they have since identified the person behind the account. There was also a report of a clown chasing a woman from her car to her apartment door. The latest clown account concerning residents hasn't posted any threats, but mentions places where clowns may visit. In addition to Colerain, the locations include Lawrenceburg, Harrison, East Central and Oak Hills. In Lawrenceburg, the clowns have neighbors around Hidden Valley Lake thinking twice about their street's theme for the upcoming Haunted Hayride. They had planned a "creepy clown" theme before clowns started popping up all over. Others said they weren't going to let their children dress as clowns for Halloween over worries it could be dangerous. "If someone did feel threatened or was afraid of a creepy clown, or someone dressed as a creepy clown with everything going on … things might escalate," Carrie Brewer said. She said it's ridiculous how far the clown threats and fears have gone. "It is sad that what is maybe being blown out of proportion," Brewer said. "Imagine kids taking this too far. It didn't need to go this way. It's going to ruin the fun."